The twin forts of Rawlya-Jawlya re located in the Saatmaal mountain range. These forts are situated on a huge plateau. Rawlya fort is difficult to climb and it is advised to visit this first before Jawlya. 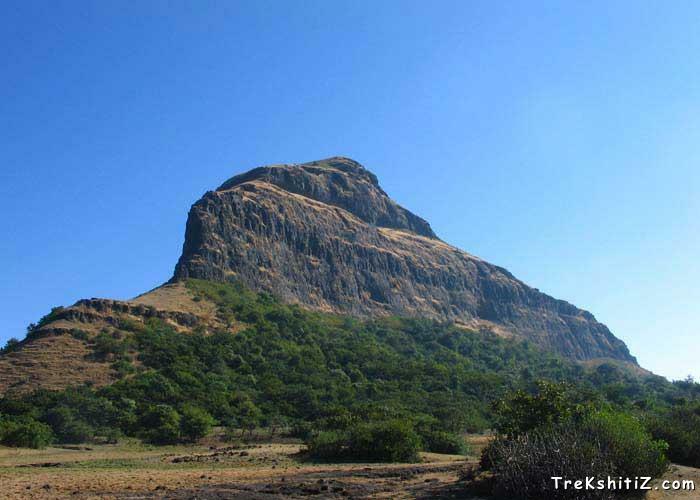 both the forts can be visited by a day�s halt from Mumbai and Nashik. Historical records state that the forts were called as �Rola-Jola�. Aliwardi Khan won this fort in 1626 for the Mughal ruler Shahajahan and later Shivaji Maharaj in 1670. In 1671, Dilerkhan laid a siege to these twin forts which was successfully hampered by the Marathas. After the Marathas, Mahabat Khan took over this fort and then it went to the Peshwas. In 1818, the British rulers captured this fort and Captain Briggs had the steps and fortification wall of the fort devastated in 1819. There are two routes to each Jawlya. One is leading straight from the hamlet which takes us to the ridge. After ascending this ridge we come across a path to the left which is clear and a used one. While going on this route there are some incomplete constructed caves to the right. The path ahead continues upwards on the ridge where another path coincides. Further from here rock cut steps which are to be dealt with caution take us to the main entrance of the fort which is also built in rock. There is a scripture on the right wall. Next to the doorway the path goes upwards while another path turns left. Here we can see a rock cut cave and a water tank. Proceed to the summit of the fort after this where one route leads to a small hill and further to the other end of the fort. Descending to the left from this point are pillared water tanks and two rock cut water tanks opposite to it. None of the tanks have potable water. Apart from this there is a horse stable area on the fort. Forts of Dhodap, Ikhara, Kanhergad, Kanchana, Indrai are visible from here. Proceed to the summit where there is a small hamlet. A person named Tiwari has built 4-5 houses here thus the hamlet is named after him. The houses are mainly used for cattle. There is a water tank and a tomb on the summit in front of the hamlet. The experience of staying on this summit is worth enjoying. 3 kms from Babapur on the Nashik-Vani-Babapur-Mulane route there is a cleft where one has to get down. A road to the right takes us to Rawlya-Jawlya while the road to the left takes us to Markandya. It takes 30 minutes to reach the cleft from Vani. Take the right path of the mountain ridge which is well used. After a 30 minutes ascend the path turns to the left and again to the right and takes us on the plateau. From the cleft to the plateau it takes about an hour�s ascend. Rawlya fort can be seen from here in the front but we have to go to the cleft between Rawlya and Jawlya hills. 45 minutes from here takes us to the base after a few patches of dense vegetation. As there are many routes on the plateau there are high chances of being misled by the wrong route and hence caution is advised to always keep Rawlya fort to our left. After crossing the dense patch we come to a hamlet. The houses in the hamlet can accommodate up to 4-5 persons. One can also camp in the open. Plateau is 2 hrs from Babapur and Mulane-Bari.